Muslim Navy is drawn from Chapter Nine, beginning on page 251, of Volume Five, The Sword of Islam of the twelve-volume historical series The Christians: Their First Two Thousand Years. If you would like to order this book please visit www.TheChristians.info. Perhaps the greatest Muslim triumph in Islam’s century of conquest was not won on land but on water, something of which the desert-born Arabs had a pathological fear. They handily overcame it, however, and in a series of encounters with the Byzantine fleet, scored what some describe as the most decisive victory of them all. They claimed the Mediterranean Sea for Islam. For more than eight hundred years–from the Roman destruction of Carthage in 146 b.c.–the Mediterranean had been mare nostrum, “our sea,” to the Romans. Maritime trade was the source of much of the empire’s wealth, and the sea was its highway. When Rome became Christian, it became, in effect, a Christian sea. At the close of the seventh century a.d., however, much of the Mediterranean fell to the Muslims. For the next hundred years, the Byzantines would contest the issue, but in Muslim hands it would largely remain. For the Muslims, intent on bestowing Islam upon the world, control of the Mediterranean was not a matter of choice, but of necessity. As long as the coastal cities of Syria, Palestine, Egypt and North Africa could be easily supplied by the Byzantine fleet, taking them was difficult and holding them impossible. Alexandria had fallen and been recaptured from the sea. So had Carthage. Soon, however, necessity dictated policy. Clearly, some form of naval organization was necessary, if only to defend the conquered coastal territories. Therefore, Umar’s successor, Uthman, permitted Mu‘awiya to carry out naval operations, but with the curious stipulation that commanders take their wives on naval campaigns–presumably to prevent rashness. Thereafter, the Muslim fleet grew rapidly. Conquest soon succeeded raiding. In 653, Mu‘awiya landed on Cyprus again, plundered it for forty days, established a garrison of twelve thousand men, and permanently occupied it. The following year, a huge Byzantine fleet (at least seven hundred ships) set out from Constantinople and met a smaller Muslim squadron in battle. It was the first great sea engagement between the upstart Muslims and the dominant sea power of the Mediterranean–and the result was a humiliating defeat for the Christian forces. Uneasy at first, the Muslim commanders put many of their troops ashore and sailed out to meet the Byzantines with half-manned ships.4 Since they considered themselves far better soldiers than sailors, they lashed their ships together with chains, creating a floating battlefield, then laid into the Byzantine marines with sword, spear and dagger. A bloody business, it lasted a day and a half, and became known as the Battle of the Masts. Unable to maneuver against the tightly packed mass of Muslim vessels, individual Byzantine ships closed with the enemy and were picked off one by one–until most of their fleet was destroyed. An estimated twenty thousand Christian sailors and marines perished. Meanwhile, in the eastern Mediterranean, the end of the Muslim civil war meant a return to large-scale naval conflict. And from 669 on, the Muslims aimed at nothing less than Mediterranean conquest, says the historian Archibald R. Lewis (Naval Power and Trade). Their main interest now was Constantinople itself. Several expeditions were aimed at the imperial capital, including a testing raid that penetrated as far as Chalcedon, a stone’s throw away on the Asian side of the Bosporus. A much bigger operation against the islands of the Aegean followed. Crete was attacked and Rhodes overrun, all as the first necessary stage in a massive assault on the Byzantine capital. In 673, a vast armada of Egyptian and Syrian naval vessels arrived to initiate what would become a seven-year blockade of Constantinople. The empire was heavily dependent on shipping for essential supplies from other parts of the empire. However, with some difficulty, the capital could be resupplied from the Black Sea, to the north, and via land routes on the European side of the Bosporus. As a result, ultimately the siege was ineffective, and the Muslim fleet withdrew. Muslim hegemony in the eastern Mediterranean now seemed to be in retreat. After a thirty-year occupation, their garrison left Cyprus and the caliph was forced to accept a peace treaty and an annual tribute to Byzantium of three thousand pounds of gold, fifty captives and fifty horses. But by the century’s end a new Muslim initiative gave them undisputed control in both east and west. The flash point this time was the ancient city of Carthage, taken by a Muslim army in 695, and regained by the Byzantines from the sea the following year. Back came the Muslims in 698, recapturing the city, and this time making their conquest permanent. Since Carthage was vulnerable to Byzantine sea attack, the conquerors dug a canal connecting the sea to a nearby inland lake. There, with the help of one thousand Coptic shipbuilders sent from Alexandria, the Muslims built a new fleet of one hundred warships. This also gave birth to the city of Tunis, capital of modern day Tunisia. With that, Carthage was abandoned, and the Muslim fleet, operating from its impregnable new base, gained complete mastery of the western Mediterranean. Never seriously challenged by the Byzantines, the Muslim navy launched massive raids against the strategic island of Sicily, and in the coming decade, they protected the flank of the Muslim armies in their conquest of Spain. Not once did the Byzantines attack them. 1. 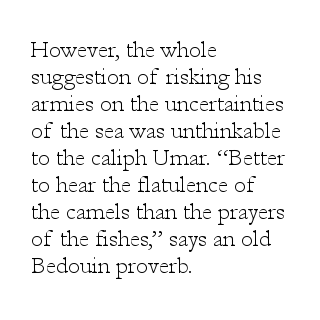 Umar’s experience of the sea had been all bad. In 638, the Muslim general al-Ala landed troops on the farther coast of the Persian Gulf. Cut off from his ships by an enemy force, he had to be rescued by Umar. Three years later, Umar authorized a naval operation on the Red Sea to ward off attacks on Arab shipping and settlements. This, too, had turned into an unmitigated disaster, with most of the ships destroyed by weather or enemy action. 3. The Colossus of Rhodes, built in 282 B.C., was a one-hundred-foot-tall bronze statue of the Greek sun god, Helios, standing astride the entrance to the harbor. An earthquake had toppled it in 226 B.C. but its impressive remains drew visitors for eight hundred years–until Mu‘awiya’s raiders dismantled it and sold it to a Jewish trader, who carried off the scrap on the backs of nine hundred camels. For many years, pieces of it turned up along the Asian caravan routes. 4. The Arabs adopted two main types of naval vessels, common in the eastern Mediterranean at the time. katenai were auxiliary transport ships, large and heavy, used mainly for hauling supplies, but which could also carry marines and be used as fighting vessels. The main “battleships” of the Arab fleet were dromons; sleek, two-story vessels with long banks of oars to supplement the sail. According to naval historian Admiral W. L. Rogers (Naval Warfare under Oars), they had a regular crew of two hundred rowers and forty or more fighting marines. In battle, there would have been a hundred or more troops packed on the dromon’s deck. All rights for this article on Muslim Navy are owned by the Society to Record and Explore Christian History (SEARCH). In accessing this page on Muslim Navy you agree to only download the content for your own personal non-commercial use.